Sammy's and Molly's mom, Katy Schrum, generously gives scraps from the dresses she makes for her daughters to my friend, Pat Llapitan and me. We decided to return the favor and make a quilt for each of the girls using the scraps from their dresses. 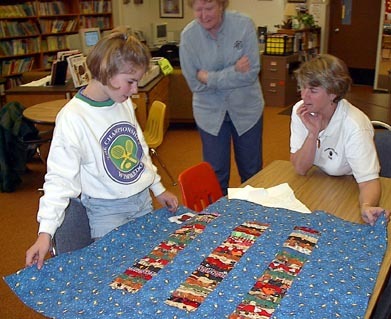 To the right is Molly's quilt and below is Sammy checking over her quilt (given March 23, 2001 just in time for her ninth birthday!) with Katy pointing out a certain fabric and Pat looking on. Pat made the pieced squares in each quilt and I made squares using applique. We each pieced the borders and put together a top. I machine quilted each and Pat finished them off by attaching the binding and the labels. 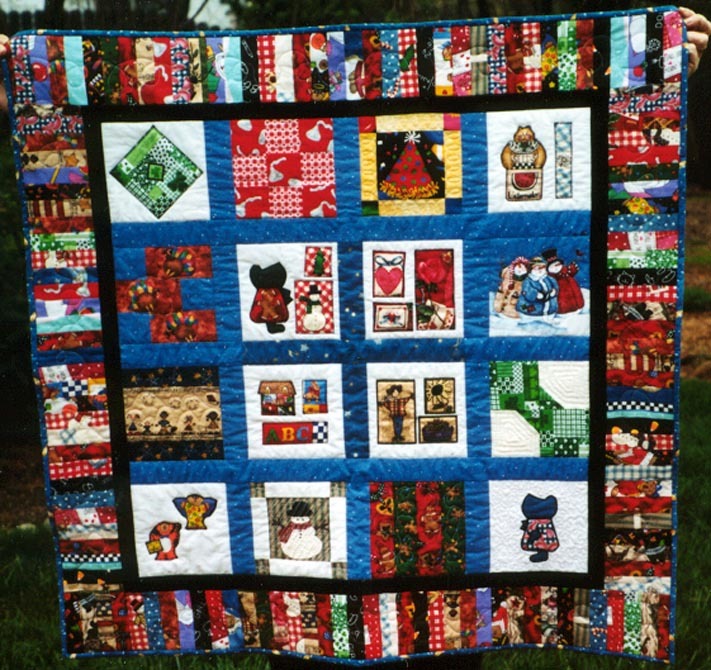 The quilt is machine pieced and machine quilted. 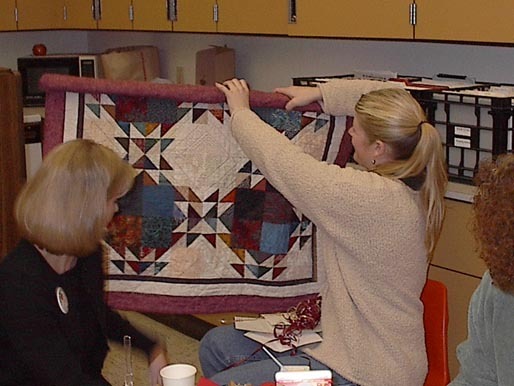 When my longtime best friend and quilting buddy, Bonnie, reached a milestone birthday it was time (November 2001) to give her a special quilt. 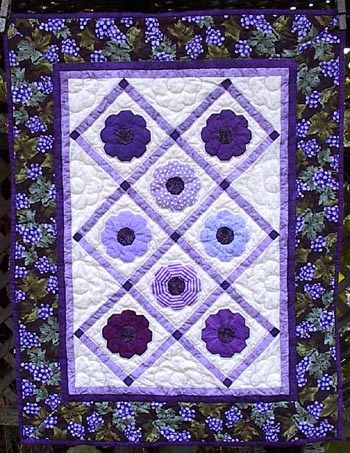 This table runner has paper pieced flowers appliqued onto squares that are then set on point and connected with a sashing. The photo copies (on the back) of our many fun times together over the last 25 years were printed on an inkjet printer to fabric that had been treated with Bubble Jet Set 2000. This wallhanging was made for my daughter-in-law, Julia Greenfield, for her birthday, April 14, 2005. 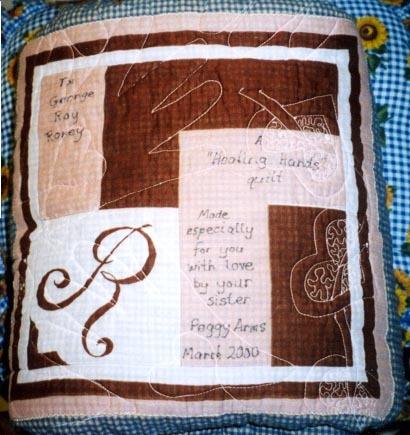 Thanks to Kitty Pippin of the Annie's Star Quilt Guild for the pattern from her first book. When I saw a panel print at Windy Moon quilt store in Reno, NV I knew I needed to buy it and make it into a quilt for my son, Adam, and his family since it was the colors of their living room. I cut out the various individual photos from the panel and machine appliqued them onto flannel squares. 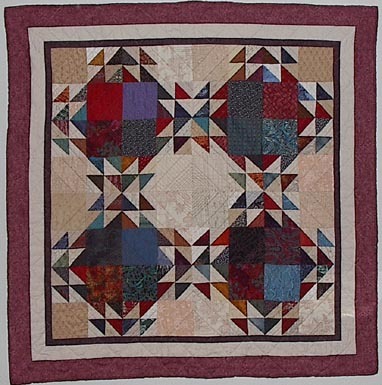 Once squares were sewn together the entire front was quilted to a fleece backing without a batting. It made for a nice couch 'throw.' We gave it to them for Christmas 2006. As the 2007-2008 school year drew to a close (as well as my career ending), I needed to thank Joan Hasek for acting as a special education long-term substitute in the same room I occupied. For her I made a table runner as a reminder of our year together. For the dedicated, hard-working Team Success paraprofessionals, a small wall hanging for each of them with photos and word lists of thanks. This wallhanging was made for my dear friend, Kay Keen. After seeing her newly painted bedroom (with a space on the wall that would be perfect for a quilt!) and being inspired by a new fabric at Morning Star Quilts (store in Paradise, CA), I just had to make this quilt. I used the tips and hints I learned from a class I took from Jeri Boe this last summer in Sisters, OR to cut and place the fabric squares. The three dimensional flower in the lower left corner was inspired by the works of Melinda Bula. Morning Star Quilts quilt store sponsored a challenge in the spring of 2009 and this was my entry, using batik fabrics supplied (sight unseen in a brown paper bag). 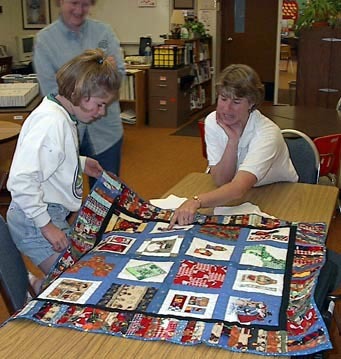 All quilts were donated to cancer patients receiving treatment at a local facility. 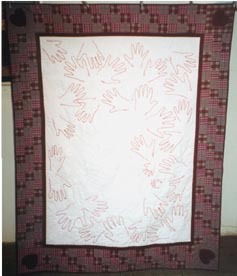 I was lucky to donate my quilt to a friend whose daughter had been a student of mine. I had fun making the quilt using techniques I had recently learned ...fabric stamping, foiling, sewing with metallic thread, and reverse applique. 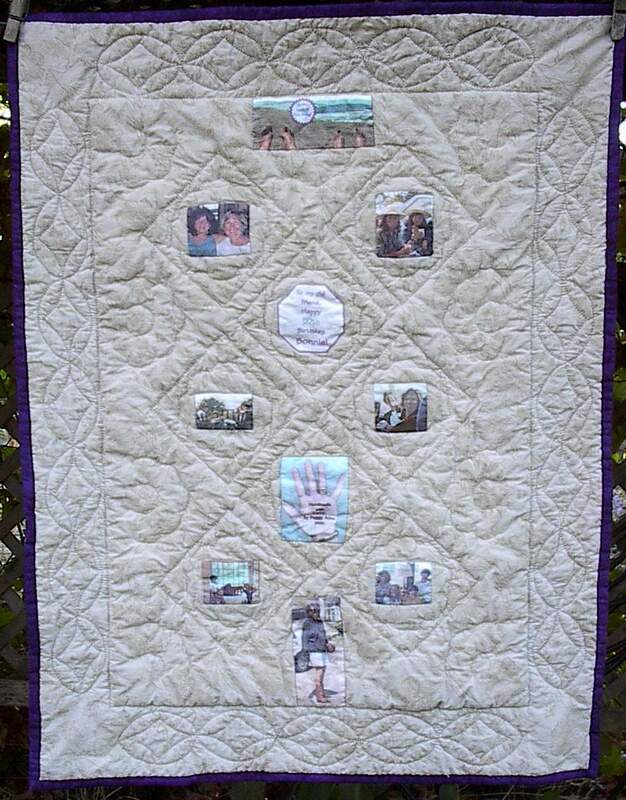 I quilted in words of 'LOVE' and 'HOPE' in reverse so they could be seen from the back while under the quilt. My prayers, love and hope are with you.